Body weight is not under our control as much as we’d like to believe, but is a tightly regulated process that involves a variety hormones with some of the major ones being leptin (a hormone that regulates fat stores by inhibiting hunger), ghrelin (a hormone that increase hunger when your stomach is empty) and insulin, which plays a very significant role in hunger, eating behavior and fat management. Insulin is one of the major controllers of the body’s “set point”. Think of set point like the thermostat in your house; when the air gets too cold, the thermostat is engaged, and the furnace comes on and when the air gets a little too hot, the thermostat shuts the furnace off. Your body’s set point is maintained by a complex set of hormonal mechanisms that works to maintain your body at its current weight. If you eat a lot more one day because it’s a special occasion, the next day you won’t feel as hungry as usual, and will eat less. When someone who normally eats a carbohydrate-based diet restricts calories, their body slows its metabolism and lowers the amount of energy (calories) it uses for vital bodily functions in order to ‘save’ the limited calories for use by their brain. In fact, the amount of energy used by your body at rest (called Basal Energy Expenditure) can decrease by as much as 30-50% in order to save those calories! This saving of calories for essential functions is why when people who are used to eating carbs ‘fast’ or limit the number of calories they eat, they feel cold, tired and find it hard to focus. This is the body ‘saving’ the few calories for essential body functions, such as for their brain and organs. This doesn’t happen to someone who is fat-adapted, because they use their own fat stores to maintain blood and brain glucose, and for other energy needs. Equally part of maintaining the body’s set point, when an overweight person takes in too many calories, their body will try to get rid of them by increasing its Basal Energy Expenditure and speeding up breathing rate (respiration), increasing heart rate and generating more body heat. So, whether we are overweight or underweight, the body will adjust its processes to maintain its ‘set point’. This is why the so-called calorie in, calorie out model, doesn’t work – because it is not simply a matter of “eating less and moving more“. When people who are carb-dependent restrict their calories, their metabolism slows and so they burn way less calories! Calories in and calories out are not independent of each other but inter-dependent on each other; when one is lowered (calories in), so is the other (calories out, metabolism). When one is increased (calories in), so is the other (calories out, respiration, heat generation). It’s really not as simple as “eating less and moving more” to lose weight, because when we both restrict calories and increase our exercise, our body responds by increasing hunger, increasing craving (especially for foods such as simple carbs that can be broken down quickly for glucose for your blood) and by decreasing the amount of energy it uses. 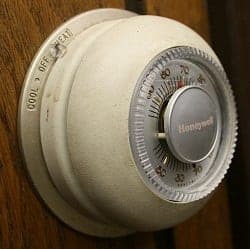 Using the thermostat analogy, our body turns the thermostat down. Wouldn’t you think that if it were really as simple as “eating less and moving more” that more people would be slim! Restricting calories doesn’t work for long term weight loss because the body compensates by lowering its energy expenditure. It’s not about how many calories we take in, but about what changes ‘set point’. It’s mainly about insulin. We have to reduce insulin. Low-carbohydrate diets and increasing the amount of time between meals (called “intermittent fasting”) are two ways to lower insulin. Lowering insulin, will in turn will lower blood sugar and when this lifestyle is maintained, over time, it has even shown by researchers to be able to reverse the symptoms of Diabetes. That doesn’t mean people aren’t Diabetic anymore – they are but the symptoms of Diabetes, namely high blood sugar (reflected in high fasting blood glucose and HbA1C) are in remission. Other added benefits include a lowering of blood pressure (which is closely tied to insulin), gradual, sustainable weight loss and a normalizing of triglycerides as well as some cholesterol markers. When people are ‘fat-adapted’, they have a ready supply of fuel for their bodies (their own fat stores! ), and so their metabolism doesn’t slow down when they eat this way. Their bodies continue to burn calories at the usual rate! Furthermore, they aren’t cold, tired and hungry because they have excess fat stores to serve as a constant supply of fuel for their brain, blood and muscles. Fat is broken down for ketone bodies which can be used for most body processes, and the essential glucose needed by our blood and brain is easily synthesized by the breaking down of fats. Thinking about adopting a low-carb or lower-carb lifestyle, but want to read more about it first? Low carb / ketogenic specific articles are located here. Have questions? Please send me a note using the Contact Us form above. Copyright © BetterByDesign Nutrition Ltd.